Replacing the MGA in 1962, production of the MGB and its variants continued until 1980. Sales for the MGB, MGC and MGB GT V8 combined totaled 523,836 cars. 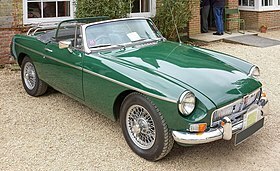 The MGB bodyshell was reprised in modified form with a limited run of 2,000 MG RV8 roadsters (1993–95). In structure the MGB was an innovative, modern design in 1962, utilizing a monocoque structure instead of the traditional body-on-frame construction used on both the MGA and MG T-types and the MGB's rival, the Triumph TR series. However components such as brakes and suspension were developments of the earlier 1955 MGA with the B-Series engine having its origins in 1947. The lightweight design reduced manufacturing costs while adding to overall vehicle strength. Wind-up windows were standard, and a comfortable driver's compartment offered plenty of legroom. A parcel shelf was fitted behind the seats. The MGB achieved a 0–60 mph (97 km/h) time of just over 11 seconds. The three-bearing 1,798 cc B-Series engine produced 95 hp (71 kW) at 5,400 rpm – upgraded in October 1964 to a five-bearing crankshaft. The majority of MGBs were exported to the US. In 1975 US-market MGB engines were de-tuned to meet emission standards, ride height was increased by an inch (25 mm), and distinctive rubber bumpers were fitted to meet bumper standards. The MGB was one of the first cars to feature controlled crumple zones designed to protect the driver and passenger in a 30 mph (48 km/h) impact with an immovable barrier (200 ton). Nevertheless, the British AA motoring association has described the car, like many other classic models, as much less safe than modern cars. The issue received public attention following a 2013 case in which a driver in a hired 1963 MGB was killed in a collision with a taxi. A limited production of 2,000 units of the RV8 was produced by Rover in the 1990s. Despite the similarity in appearance to the roadster, the RV8 had less than 5% parts interchangeability with the original car. All MGBs (except the V8 version) utilised the BMC B-Series engine. This engine was essentially an enlarged version of that used in the MGA with displacement being increased from 1,622 to 1,798 cc. The earlier cars used a three-main-bearing crankshaft, 18G-series. In February 1964 positive crank-case breathing was introduced and the engine prefix changed to 18GA, until October 1964, when a five-bearing crankshaft design was introduced, the engine prefix became 18GB. Horsepower was rated at 95 net bhp on both five-main-bearing and earlier three-bearing cars with peak power coming at 5,400 rpm with a 6,000 rpm redline. Torque output on the MGB had a peak of 110 lb⋅ft (150 N⋅m) and fuel consumption was around 25 mpg. US specification cars saw power fall in 1968 with the introduction of emission standards and the use of air or smog pumps. In 1971 UK spec cars still had 95 bhp (71 kW) at 5,500 rpm, with 105 lb⋅ft (142 N⋅m) torque at 2,500 rpm. Engine prefixes became 18V and the SU carburettor needles were changed for reasons of the latest emission regulations, under ECE15. By 1973 it was 94 bhp (70 kW); by 1974 it was 87, with 103 lb⋅ft (140 N⋅m) torque; by 1975 it was 85 with 100 lb⋅ft (140 N⋅m). Some California specification cars produced only around 70 hp (52 kW) by the late 1970s. The compression ratio was also reduced from 9:1 to 8:1 on US spec cars in 1972. All MGBs from 1963 to 1974 used twin 1.5-inch (38 mm) SU carburettors. US spec cars from 1975 used a single Stromberg 1.75-inch (44 mm) carburettor mounted on a combination intake–exhaust manifold. This greatly reduced power as well as created longevity problems as the (adjacent) catalytic converter tended to crack the intake–exhaust manifold. All MGBs used a SU-built electric fuel pump. All MGBs from 1962 to 1967 used a four-speed manual gearbox with a non-synchromesh, straight-cut first gear. Optional overdrive was available. This gearbox was based on that used in the MGA with some minor upgrades to cope with the additional output of the larger MGB engine. In 1968 the early gearbox was replaced by a full synchromesh unit based on the MGC gearbox. This unit was designed to handle the 150net bhp of the three-litre engine of the MGC and was thus over-engineered when mated with the standard MGB B-Series engine. The same transmission was used in the 3.5-litre V8 version of the MGB-GT-V8. An automatic three-speed transmission was also offered as a factory option, but was unpopular. Electrically engaged overdrive gearboxes were an available option on all MGBs. The overdrive unit was operational in third and fourth gears (until 1977, when overdrive was only operational in fourth) but the overall ratio in third gear overdrive was roughly the same as fourth gear direct. The overdrive unit was engaged by a toggle switch on the dashboard. The switch was moved to the top of the gearshift knob in 1977. Overdrives were fitted to less than 20% of all MGBs. There were three different types of overdrive transmissions fitted to the MGB. The gearbox input shaft, flywheel and engine backing plate were changed with the advent of the five-main-bearing engine in 1965. Therefore, the transmission for a three-main-bearing engine (1962–1964) differed from its later counterpart. Overdrive operated in fourth gear only in units made from February 1977 onward. Early MGBs used the "banjo" type differential carried over from the MGA with the rear axle ratio reduced from the MGA's 4.1 (or 4.3) to 3.9 to 1. (Compensating for the reduction from 15 inch to 14-inch (360 mm) wheels). MGB GTs first began using a tube-type rear axle in 1967. This unit was substantially stronger, being, like the later gearbox, designed for the three-litre MGC. All MGBs used the tube-type axle from 1968. All MGBs were fitted with 11-inch (280 mm) solid (non-ventilated) disc brakes on the front with drum brakes on the rear. The front brake calipers were manufactured by Girling and used two pistons per caliper. The brake system on the MGB GT was the same as the roadster with the exception of slightly larger rear brake cylinders. A single-circuit hydraulic system was used before 1968 when dual-circuit (separate front and rear systems) were installed on all MGBs to comply with US regulations. Servo assistance (power brakes) was not standard until 1975. Many modern and contemporary testers have commented on the very heavy brake pedal pressure needed to stop the non-servo-assisted cars. The MGB initially had an extremely simple electrical system. Dash-mounted toggle switches controlled the lights, ventilation fan, and wipers with only the direction indicators being mounted on a stalk on the steering column. The ignition switch was also mounted on the dash. Like the MGA, the MGB utilized two 6-volt batteries wired in series to give a 12-volt positive earth configuration. The batteries were placed under a scuttle panel behind the seats making access difficult; the location gave excellent weight distribution and thus improved handling. The charging system used a Lucas dynamo. Later MGBs had considerable changes to the electrical system including the use of a single 12-volt battery, a change from positive to negative earth, safety-type toggle (rocker) switches, alternator in lieu of dynamo, additional warning lights and buzzers, and most common functions moved to steering column stalks. From 1972 there were two different radial sizes factory-fitted to new cars, depending on whether the car was a roadster,(155/80x14) or a GT,(165/80x14). With the 1974.5 arrival of the rubber bumper cars the factory-fitted tyre size was simplified to 165/80x14 for all cars, irrespective of whether the car was a roadster or a GT, and also irrespective of the wheel type (wire or RoStyle). Later on during the rubber bumper production period, alloy wheels were introduced on several different limited edition models - with the final 1,000 LE models being the last cars to leave the factory with alloy wheels which, although the same 5"x14" rim size as the RoStyle, had 185/70x14 radials fitted. This wider tyre was not factory fitted to wire wheels. The factory built V8s were fitted with full profile 175HR14 tyres. The roadster was the first of the MGB range to be produced. The body was a pure two-seater; a small rear seat was a rare option at one point. By making better use of space the MGB was able to offer more passenger and luggage accommodation than the earlier MGA while being 3 inches (75 mm) shorter overall. The suspension was also softer, giving a smoother ride, and the larger engine gave a slightly higher top speed. The four-speed gearbox was an uprated version of the one used in the MGA with an optional (electrically activated) overdrive transmission. Wheel diameter dropped from 15 to 14 inches (360 mm). In late 1967, sufficient changes were introduced for the factory to define a Mark II model for the 1968 model year. Changes included synchromesh on all four gears with revised ratios, an optional Borg-Warner automatic gearbox (except in the US), a new rear axle, and an alternator in place of the dynamo with a change to a negative earth system. To accommodate the new gearboxes there were significant changes to the sheet metal in the floorpan, and a new flat-topped transmission tunnel. To meet US safety regulations for the 1968 model year, the MGB received a plastic and foam rubber covered "safety" dashboard, dubbed the "Abingdon pillow", and dual circuit brakes. Other markets continued with the steel dashboard. Rubery Owen RoStyle wheels were introduced to replace the previous pressed steel versions in 1969 and reclining seats were standardised. 1969 also saw three windscreen wipers instead of two (to sweep the required percentage of the glass), high back seats with head restraints and side marker lamps. The next year saw a new front grille, recessed, in black aluminium. The more traditional-looking polished grille returned in 1973 with a black "honeycomb" insert. In North America, 1970 saw split rear bumpers with the number-plate in between, 1971-1974 returned to the earlier single-piece full-length style chrome bumper. Further changes in 1972 were to the interior with a new fascia. To meet impact regulations, 1974 US models had the chrome bumper over-riders replaced with oversized rubber ones, nicknamed "Sabrinas" after the British actress. In the second half of 1974 the chrome bumpers were replaced altogether. A new, steel-reinforced black rubber bumper at the front incorporated the grille area as well, giving a major restyling to the B's nose, and a matching rear bumper completed the change. New US headlight height regulations also meant that the headlamps were too low. Rather than redesign the front of the car, British Leyland raised the car's suspension by 1-inch (25 mm). This, in combination with the new, far heavier bumpers, resulted in significantly poorer handling. For the 1975 model year only, the front anti-roll bar was deleted as a cost-saving measure (though still available as an option). The damage done by the British Leyland response to US legislation was partially alleviated by revisions to the suspension geometry in 1977, when a rear anti-roll bar was made standard equipment on all models. US emissions regulations also reduced horsepower. In March 1979 British Leyland started the production of black painted limited edition MGB roadsters for the US market, meant for a total of 500 examples. Due to a high demand for the limited edition model, production ended with 6,682 examples. The UK received bronze-painted roadsters and a silver GT model limited edition. The production run of homemarket limited edition MGBs was split between 421 roadsters and 579 GTs. The last MGB roadster produced at Abingdon returned to Abingdon County Hall Museum on 1 December 2011, with the help of British Motor Heritage. It was lifted up 30 feet through a first floor window of the Grade I listed building with inches to spare and now forms part of the collection on display in the main gallery. Work on a successor for the MGB had been undertaken as long ago as 1968, but British Leyland had ceased work on that project by the end of 1970. When the Abingdon factory finally closed in late 1980, British Leyland did not replace it. The fixed-roof MGB GT was introduced in October 1965. Production continued until 1980, although export to the US ceased in 1974. The MGB GT sported a ground-breaking greenhouse designed by Pininfarina and launched the sporty "hatchback" style. By combining the sloping rear window with the rear deck lid, the B GT offered the utility of a station wagon while retaining the style and shape of a coupe. This new configuration was a 2+2 design with a right-angled rear bench seat and far more luggage space than in the roadster. Relatively few components differed, although the MGB GT did receive different suspension springs and anti-roll bars and a different windscreen which was more easily and inexpensively serviceable. Although acceleration of the GT was slightly slower than that of the roadster, owing to its increased weight, top speed improved by 5 mph (8.0 km/h) to 105 mph (169 km/h) because of better aerodynamics. The MGB Berlinette produced by the Belgian coach builder Jacques Coune utilised a raised windscreen to accommodate the fastback. Fifty-six were produced. The MGC was a 2,912 cc, straight-six version of the MGB sold from 1967 and produced until August 1969 with some sales running on into 1970. The car was given the model code ADO52. It was intended as a replacement for the Austin-Healey 3000 Mk. III which would have been ADO51 but in that form never got beyond the design proposal stage. The first engine to be considered was an Australian-designed six-cylinder version of the BMC B-Series but the production versions used a new seven-main-bearing development of the Morris Engines designed C-Series that was also to be used for the new Austin 3-litre four-door saloon. In the twin SU carburettor form used in the MGC the engine produced 145 bhp (108 kW) at 5,250 rpm. The body shell needed considerable revisions around the engine bay and to the floor pan, but externally the only differences were a distinctive bonnet bulge to accommodate the relocated radiator and a teardrop for carburettor clearance. It had different brakes from the MGB, 15 inch wheels with Pirelli Cinturato 165HR15 tyres (CA67). a lower geared rack and pinion and special torsion bar suspension with telescopic dampers. Like the MGB, it was available as a coupé (GT) and roadster. An overdrive gearbox or three-speed automatic gearbox were available as options. The car was capable of 120 mph (193 km/h) and a 0–60 mph time of 10.0 seconds. The heavy engine (209 lb heavier than the 1,798 cc MGB engine) and new suspension changed the vehicle's handling, and it received a mixed response in the automotive press. It later transpired that the BMC press department had set the tyre pressures of the cars in the launch fleet incorrectly (to the same values as the standard MGB) and that even the correct pressures were insufficient to get the best handling from the car. Poor reviews also stemmed from the fact that, despite BMC's marketing, the MGC was not a direct replacement for the Austin-Healey 3000 and neither was it a higher-performance MGB. The MGC was cancelled in 1969 after less than two years of production. At the time of the car's launch the manufacturers stated that the Austin-Healey 3000 would continue to be offered as a parallel model priced on the domestic market at £1,126, compared to the MGC's £1,102. MG began offering the MGB GT V8 in 1973 utilising the ubiquitous aluminium block 3,528 cc Rover V8 engine, first fitted to the Rover P5B. This engine had been used in the unibody GM 1961–1963 A-body platform Buick Special/Skylark and Oldsmobile F-85 and 1961–1962 Pontiac Tempest and was the lightest mass-production V8 in the world. The Buick version had a dry, undressed weight of 318 lb (144 kg) and the 1963 Skylark with optional four-barrel Rochester carburettor and 10:1 compression ratio produced 200 hp (150 kW) at 5,000 rpm. By the time Rover had made webbing modifications to strengthen the block, the engine was considerably heavier (over 170 kg). Some changes were made by MG-Rover and the engine found a long-lived niche in the British motor industry. These cars were similar to those already being produced in significant volume by tuner Ken Costello. MG even contracted Costello to build them a prototype MGB GT V8. However, the powerful 180 bhp (134 kW) engine used by Costello for his conversions was replaced for production by MG with a more modestly tuned version producing only 137 bhp (102 kW) at 5,000 rpm. Nonetheless, 193 lb⋅ft (262 N⋅m) of torque helped it hit 60 mph (97 km/h) in 7.7 seconds and go on to a 125 mph (201 km/h) top speed. Fuel consumption was just under 20 mpg. By virtue of its aluminium cylinder block and heads, the Rover V8 engine weighed approximately 40 pounds less than MG's iron four-cylinder. Unlike the MGC, the V8 that provided the MGB GT V8's increased power and torque did not require significant chassis changes nor sacrifice handling. Both chrome and rubber-bumpered GT versions of the V8-powered MGB were produced by the factory with production ending in 1976. MG never attempted to export the MGB GT V8 to the United States. It chose not to develop a left-hand-drive version of the MGB GT V8 although the Rover V8 engine was offered in US-bound Rover models. The P6 3500 was withdrawn after 1971 from the USA and the Rover 3500 SD1 only introduced in 1980 (its engine equipped with power-sapping emissions equipment) so that during the lifetime of the MGB GT V8 the engine was not being built in a federal version. Abingdon built seven LHD models, sent them to America to achieve certification, and brought them back to the UK to be sold to mainland European countries. Subsequent to the launch of the Mazda MX-5 in 1989, MG (by then owned by Rover Group) produced new body panels for the standard MGB body shell in 1992 to create an updated MGB model. The suspension was only slightly updated, sharing the leaf spring rear of the MGB. The boot lid and doors were shared with the original car, as were the rear drum brakes. The engine was the 3.9-litre version of the aluminium Rover V8, similar to the one previously used in the MGB GT V8. A limited-slip differential was also fitted. The interior featured veneered burr elm woodwork and Connolly leather. The engine produced 190 bhp (142 kW) at 4,750 rpm, achieving 0–60 mph (96 km/h) in 5.9 seconds. Largely due to the rear drum brakes and rear leaf springs, the RV8 was not popular with road testers. A large proportion of the limited MG RV8 production went to Japan – 1,579 of the 1,983 produced. Three-hundred and thirty RV8s were sold initially in the UK. Several hundred (possibly as many as 700) of these cars were re-imported back to the UK and also Australia between 2000–2010 with a peak number of 485 registered at the DVLA in the UK. Several sources consider this a continuation of the MGB model. The MGB was assembled in Australia from 1963 to 1972, during which time approximately 9,000 were sold. The cars were assembled from complete knock down kits shipped from England. Initially, assembly was undertaken by the Pressed Metal Corporation at its Enfield facility, but was subsequently moved to BMC Australia’s Zetland plant in 1968. Australian assembly ended in 1972 when the government issued a requirement that, to enjoy favourable tariff treatment, locally produced cars should feature 85% local content. At the time, the local content of the Australian assembled MGBs was evaluated as just 45%. All MGBs assembled in Australia were roadsters. 1965 MGB to FiA Appendix K Specification with period race modifications. Very similar to the cars that raced in the 1960s. Specially tuned MGBs (including some with aluminium panels) were successful in international road competition events, scoring a Grand Touring category victory in the 1965 Monte Carlo Rally. Circuit racing wins included the Guards 1000 miles race at Brands Hatch in 1965 and the 84-hour Marathon de la Route at the Nürburgring in 1966. MGBs also won the GT Category in the 1966 Targa Florio, the 1966 Spa 1000 and the 1967 Spa 1000. ^ "New Sports Car Tops 107 M.P.H.". The Times (55501). 20 September 1962. p. 5. ^ "1967 MGB 30mph frontal impact into a concrete block, Abingdon in 1967 (scroll down)". Mgb-stuff.org.uk. Retrieved 2011-07-26. ^ Wilson, Quentin (1995). The Ultimate Classic Car Book. DK Publishing. ISBN 0-7894-0159-2. ^ a b c d e "Archived copy". Archived from the original on 2013-06-12. Retrieved 2014-06-05. ^ a b "Autotest – MG MGC Automatic". Autocar. Vol. 129 (nbr 3795). 7 November 1968. pp. 10–14. ^ a b c d e f Culshaw; Horrobin (1974). Complete Catalogue of British Cars. London: Macmillan. ISBN 0-333-16689-2. ^ Clausager, Anders Ditlev (2010). Original MGB - With MGC and MGB GT V8. United Kingdom: Herridge & Sons Ltd. pp. 10, 16, 18, 19, 25, 33, 34, 35, 40, 43. ISBN 978-1-906133-18-4. ^ "Television news item". YouTube. BBC Oxford News. 1 December 2011. Retrieved 8 July 2012. ^ "MG Exhibition". Abingdon-on-Thames, UK: Abingdon County Hall Museum. Retrieved 8 July 2012. ^ "MG roadster, soft top; MG Works; 23.10.1980AD; BMHT Loan.1". eHive, Vernon Systems. Abingdon County Hall Museum. Retrieved 8 July 2012. ^ "Austin Rover Online". Aronline.co.uk. Archived from the original on 2012-07-18. Retrieved 2011-07-26. ^ "Used Car Test:1969 MGC". Autocar. Vol. 135 nbr 3940. 30 September 1971. pp. 18–19. ^ a b The Motor. Road test. 4 November 1967. ^ "Pirelli Cinturato ™". www.cinturato.net. Archived from the original on 31 January 2012. Retrieved 14 February 2017. ^ "Autocar Road Test: MG MGC: New derivative of MGB with six-cylinder engine ... Lack of low speed torque and engine reluctant to rev. Very noisy fan. New all synchromesh gearbox works well but has odd choice of ratios with overdrive. Heavy fuel consumption. Light brakes, with some fade. Good ride; strong understeer; steering low geared. Lots of leg-room. Heater extra. Good finish". Autocar. Vol. 127 (nbr 3744). 16 November 1967. pp. 28–32. ^ "Safety Fast September 99 – MGC Newsletter". Mgcars.org.uk. Retrieved 2009-12-11. ^ David Dolbel (2010-09-12). "Presenting the MG RV8 at". Mgrv8.com. Retrieved 2010-11-28. ^ "One last hurrah: the 1994 MG RV8". Autoweek. Retrieved 2018-04-18. ^ "MG RV8 (1992–1995)". rac.co.uk. Retrieved 7 November 2014. ^ "Number of vehicles licensed or SORN, since 1994". howmanyleft.co.uk. Retrieved 7 November 2014. ^ "MG RV8 A Clever Reboot of the MG Sports Car Franchise". Hemmings.com. ^ a b c d "News: MGB ends down under". Autocar. Vol. 137 (nbr 3992). 30 November 1972. p. 15. Wikimedia Commons has media related to MG B.
Clausager, Anders Ditlev (1994). Original MGB With MGC and MGB GT V8. Bay View Books Ltd. ISBN 1-870979-48-6. Holmes, Mark (2007). Ultimate Convertibles: Roofless Beauty. London: Kandour. pp. 106–107. ISBN 978-1-905741-62-5. "MGB Home Page". MG Enthusiasts. Retrieved 21 March 2005. "MGC Home Page". MG Enthusiasts. Retrieved 21 March 2005. "MGB Buyers Guide". British Owners Group. Retrieved 21 March 2009. "MGB Buyers Guide". Classic Motorsports magazine. Archived from the original on 23 September 2009. Retrieved 7 April 2009. Adams, Keith. "The Unofficial Austin Rover Web Resource". Archived from the original on 2010-09-30.